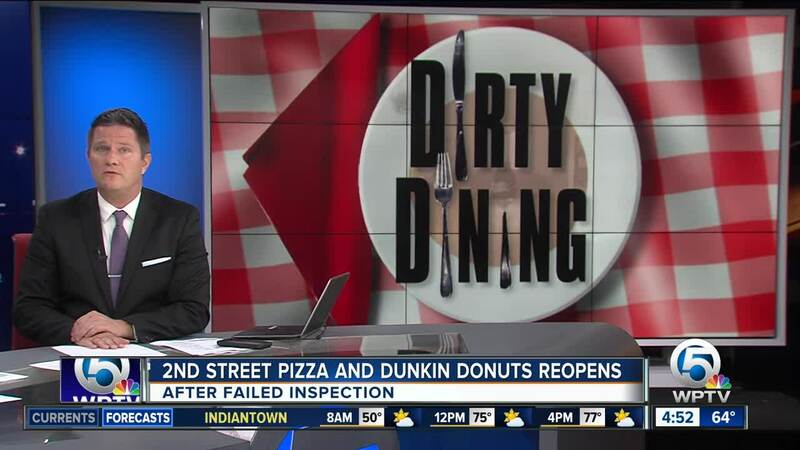 Three restaurants were temporarily closed last week, after inspectors found roaches and rodents inside. Three restaurants were temporarily closed last week after inspectors found roaches and rodents inside. On Jan. 30, state inspectors found four dead roaches, five live roaches and 29 rodent droppings inside 2nd Street Pizza restaurant in Okeechobee County. In total, they found three high-priority violations. Live roaches and a small rodent were found inside Le Berger on South Dixie Highway in Lake Worth on Jan. 30. Inspectors found five live roaches in a prep area and the small rodent was under a prep table. In total, four high-priority violations were found by inspectors. On Jan. 31, the Dunkin' Donuts at 5641 Okeechobee Blvd. near West Palm Beach had flying insects found on several donuts. Those donuts had to be thrown away. The report said food was contaminated by "small flying insects three on Chocolate Bling frosted donuts in display case." The location had a total of two high-priority violations. All three restaurants have re-opened. The health and safety of customers is our top priority. We have stringent food safety and quality standards, and we take great pride in the food and beverages served to our guests every day. We take the Florida Department of Business and Professional Regulation’s assessment of the franchised Dunkin’ restaurant in West Palm Beach very seriously. The franchisee who owns and operates the location has corrected all of the issues addressed during the inspection. We also immediately sent one of our certified operations managers to meet with the franchisee, inspect the store, and ensure that all appropriate Dunkin' food safety guidelines are being followed. A public health inspector re-inspected the restaurant, allowing it to reopen on January 31, 2019.